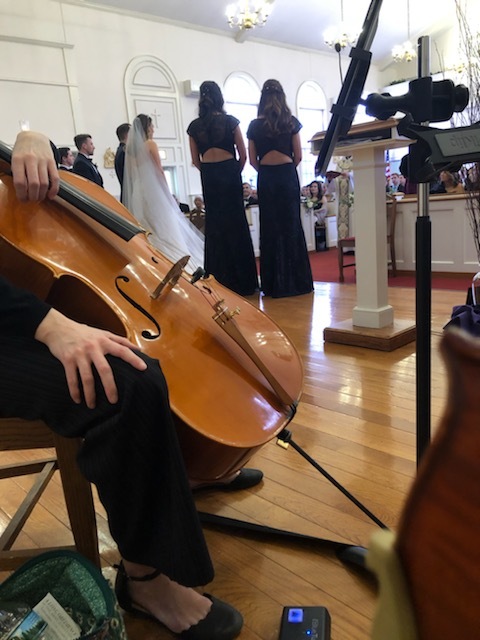 We kicked off our 2019 weddings with a beautiful church wedding in Topsfield, MA. We perform for all types of weddings, but it definitely takes some extra planning to coordinate a Catholic mass. Thankfully, we have performed for hundreds of Catholic mass celebrations before and know all of the ins and outs of planning the music for a mass wedding. Often, Catholic brides choose many of their pop favorites for the prelude, processional and recessional as the main part of the mass ceremony must include all sacred and classical selections. This was our first wedding of the year and first gig of the year with myself, Jamie and Laura performing. It was great to be back together! The pianist, Susan and cantor, Ellen were wonderful to work with! It makes things happen much more smoothly when all of the musicians involved are well prepared and flexible. The ceremony was a beautiful celebration of the couple’s love!